• Great way to end season, with 5 personal bests and almost 7! • Brett Haffner (#15), Chris Joseph (#19), and Trevor Schauer (#46) move up on all-time Detweiller list! • Great 2nd mile—team passed 63 runners from mile 1 to 2! • Let’s work hard and get back in the top 10 next year!! • We’re going to State!!! 3rd straight year! 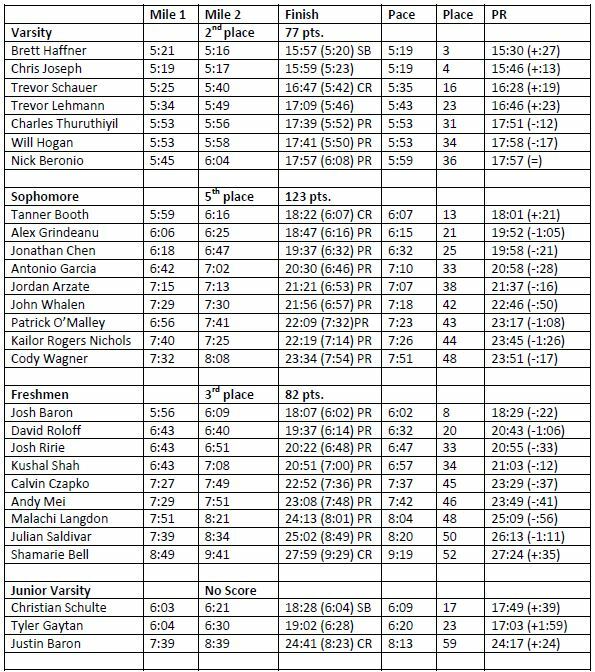 • We had the 3rd fastest 5th man, 2nd fastest 6th man, and the 3rd best 1-5 runner splits in the meet! • All obviously helped, but special mention to Brett, for running well after falling after the mile, and Charles, who ran his best race ever. Without either of these performances, we are in danger of not qualifying! • Brett Haffner now #8 all time Hinsdale South at KLM, Chris Joseph #10, and Trevor Schauer tied for #45! ​• Great job by everyone! 19 personal bests out of 29 runners; 2 season bests, 4 course bests! • Brett Haffner, Chris Joseph, Trevor Schauer, Tanner Booth, and Josh Baron All-Conference! • 8 personal bests despite conditions! 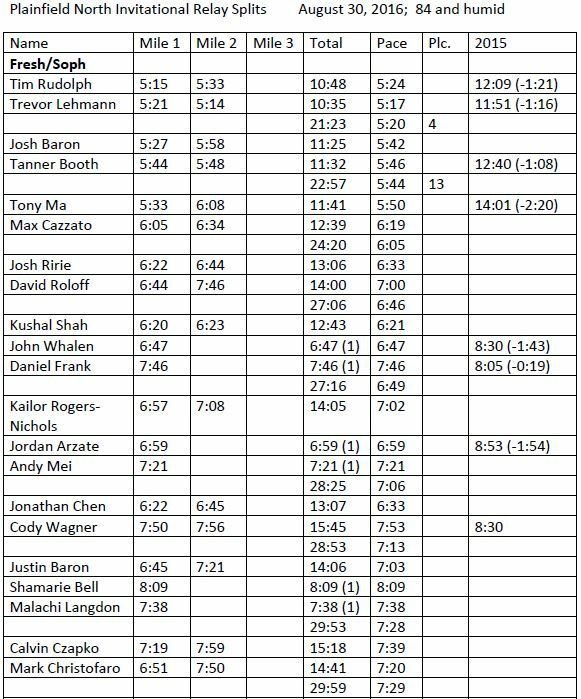 • Timing malfunction in freshmen race—will try to get estimated times for remaining freshmen. • Huge improvements over last year and lots of course records (CR)! 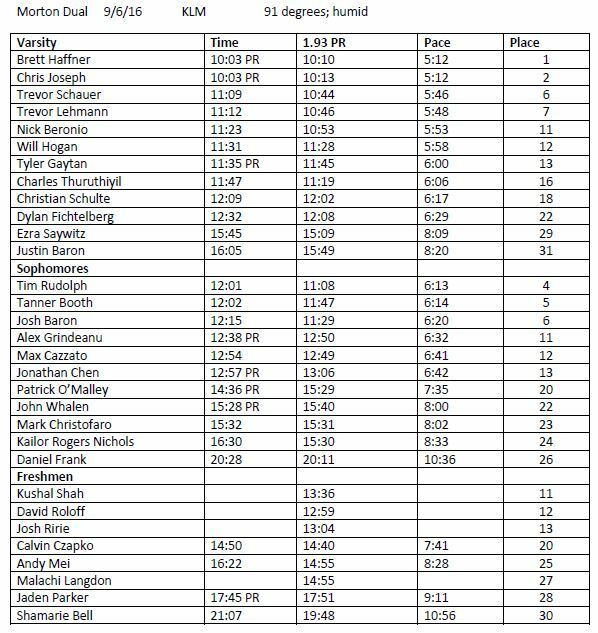 • HUGE improvements for freshmen since Monday’s meet! Almost 1 minute per person! 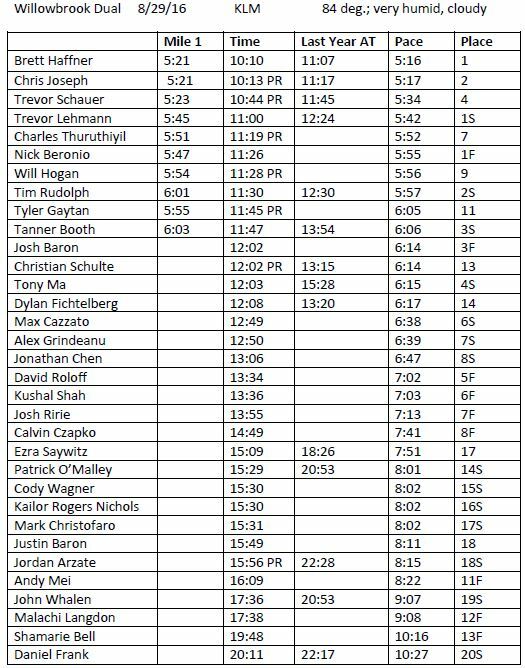 • Chris Joseph (16th), Brett Haffner (20th), and Trevor Schauer (76th) all move up on All-Time team top KLM times! Great improvements by returning athletes, and excellent times by newcomers! 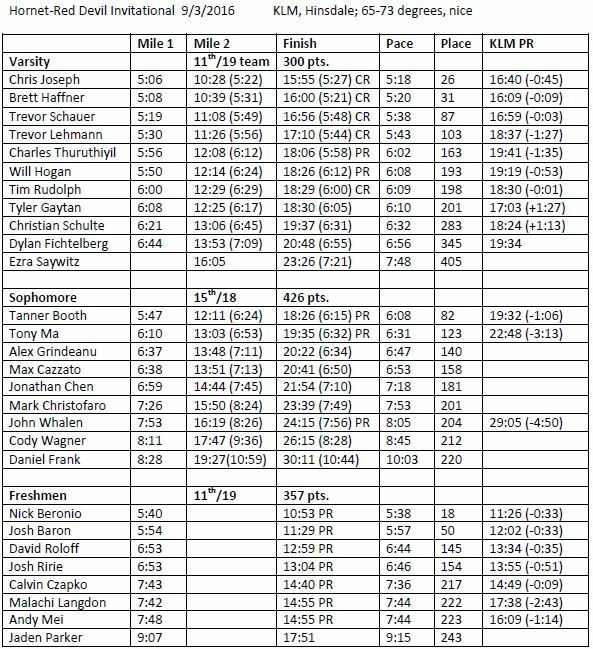 Trevor Schauer/Chris Joseph and Tim Rudolph/Trevor Lehmann actually both ran faster team times than last year’s winning time—just tougher competition this year! 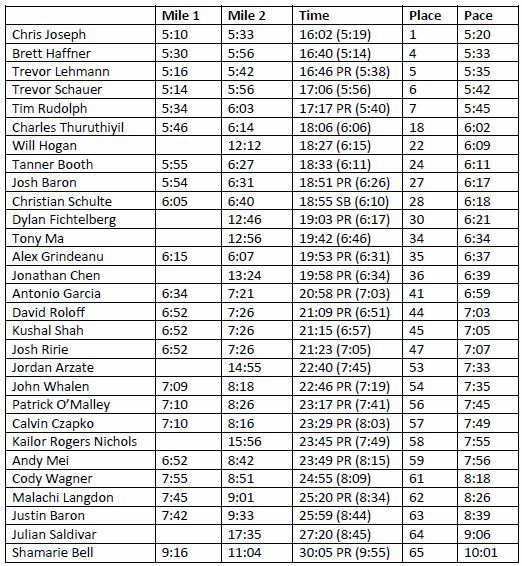 Trevor Lehmann and Tim Rudolph’s total times rank #2 and #3 in team history behind Brett Haffner’s 2015 time of 10:25. Nice opener in very uncomfortable conditions! Good job helping with the course and taking care of business!